Gig Harbor Blazing Onion is located in Uptown Gig Harbor. Our Gig Harbor location was the first to have a Sports Lounge as big as the restaurant for adults. This hybrid style of splitting the Lounge from the Fast Casual restaurant was so popular that it has continued in all the Blazing Onion's built since. Your fun and socializing will include signature cocktails, great Northwest craft brews, wonderful wines, and 16 televisions to watch the game! Uptown Gig Harbor hosts concerts and other events throughout the year. The location is spacious for walking and is conveniently set right off the highway. It features over 40 stores, retail boutiques, anchor stores, restaurants and more including Marshalls and Galaxy Theatre's. Come explore this unique and beautiful place and then stop by Blazing Onion for a great gourmet burger, salad or dessert! Our menu features over 25 unique gourmet burgers including a meatloaf burger, a buffalo burger and a wild boar burger. Do you have a favorite burger combination, it’s probably on the menu. We insist on high-quality ingredients such as Tillamook cheese, thick-cut peppered bacon, homemade burger sauces, locally baked buns, fresh produce and ALL Natural ground chuck. For a healthier option substitute our ground chuck for a fresh chicken breast, our house made turkey patty or our house made farmhouse vegetarian patty. We press each burger patty in house from fresh-never frozen, ALL Natural (meaning – no anti-biotics, no hormones, vegetarian fed), 100% ground chuck from Painted Hills. It’s literally a mouth full. We top each of our gourmet burgers with our own top secret signature burger seasoning and serve them on locally baked buns that don’t fall apart when confronted with lots of juicy sauces. Of course we’re not just about great burgers, check out the full menu. 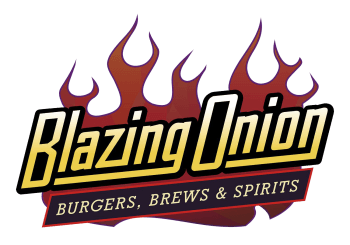 We have lots of fun at Blazing Onion in Gig Harbor! Take a look at our photo gallery for a peek inside. Uptown Gig Harbor host numerous events, including Fashion Shows, Easter Egg Hunts, Beer Festivals, Concerts and more.